Some exciting news for 2019: I curate and organize a series that focuses and connects the jazz szenes of Berlin, London, New York, Oslo with Cologne. Guests will be musicians as James Maddren, Jonas Westergaard, Eyolf Dale, Brandon Seabrook, Christian Lillinger and many others. The first concert takes place at March 30th at LOFT. It is always a long path to go before you hold a CD in your hands. I started to plan this release in spring 2017, designing and thinking about new music. The result could not be more satisfactory. Verneri Pohjola and Dierk Peter are guests solists around my Cologne quartet with Lucas Leidinger, Thomas Sauerborn and Florian Herzog. "Rise Beyond" - the idea is to look forward, far beyond the nearest horizon. Release: 19th of November 2018 at TANGBILE MUSIC. A new label to connect the whole Jazz and improvised Music scene of Cologne is online. Proud to present "Jazzstadt" (City of Jazz). The new website includes a concert calender, news section, portraits of the Cologne Jazz history and current projects. Thomas Loewner @ Jazzfacts reports about my work! 04/2018 . Concerts at the German Consulate, Carnegie Hall and at NYU brought TRILLMANN back to the metropole of Jazz. I am very proud to present the start of my own label TANGIBLE MUSIC. Tangible Music focuses on Jazz and improvised Music, the first two releases feature my quartet with Dierk Peters, Drew Gress and Jochen Rueckert and the ensemble TRILLMANN. Go to the website to check it out! On March 1st we played with MAKKRO at the Cologne Open, a new Showcase Festival for the Szene of Cologne. On March 1st my new Label TANGIBLE MUSIC says hello to the world. Also, a very special CD is coming out and a dream is coming true. To be part of a band with my long time heroes Drew Gress and Jochen Rückert. Order CD on Tangible Music! The 2016 Cologne based residence project featured Peter Evans. Peter was invited to create a three day program, showing his musical work. Stay tuned for 2017. The concept created Mascha Corman and myself. On April 20th I played at Carnegie Hall with these great musicians: Dierk Peters (vib), Jakob Dreyer (b), Jochen Rückert (dr). We are playing again at the 2nd of May at the Kennedy Center in Washington DC. There is a Livestream on Youtube at 2nd of May 6pm (USA). I am happy to share the newest videos with you. This is from our concert at the 8th of March 2017 at Club Subway in Cologne. After having a great time touring with Trillmann in January I now enjoy being back in New York. Here I focus on the preparations for the projects in March in Germany with MAKKRO & Subway Jazz Orchestra and for the concerts in NYC in April and May with Trumann Peters Quartet (with Dierk Peters-vib, Jakob Dreyer-b and Jochen Rückert-dr). I received a special Christmas present today! The video recordings of my Quartett with Lucas Leidinger (p), Florian Herzog (b) and Thomas Sauerborn (dr) are ready. We recorded with Christian Heck and Refining Arts at Loft Köln. All videos can be watched here. Receiving the "Förderpreis des Landes NRW 2016"
At November 14th I went to Münster in Westphalia to receive the sponsorship award of music of the NRW country by minister Bernd Neuendorf. It was an event full evening with prices for young creators of art and culture in this country. I am glad to receive this price, and I thank everyone who made this possible. Köln, 9. September - Ich fühle mich sehr geehrt über die diesjährige Auszeichnung mit dem Förderpreis des Landes NRW in der Kategorie Musik. Meine Vorgänger, vor allem im Jazz, sind sehr geschätzte Kollegen und Vorbilder (u.A. Nils Wogram, Nils Klein). I am glad about this year promotion award of the country of Northrhine Westphalia. August 17th - Manchester and the landscape around are beautiful. I definetely recommend it. I had the pleasure to have a great day at Mick Rath´s trombone manufactory and to choose a new horn. The 14-member strong Rath team have left a strong impression on me. My new trombone is now the R2 model with brass bell, nickel tuning slide and nickel leadpipe (for all the nerds...). Thank you Mick Rath! June 12th - Long day, short night - I had fun to listen to great trombone players and I am grateful to call me the "winner" of the J.J. Johnson competition. Even if every finalist deserved it! Now I am looking forward to go over to Michael Rath Trombones in England to choose a new Trombone! There are several ensembles I play with and projects I curate and organize. Album Release in February 2018. About "Be Here, Gone and Nowhere"
Foundet in 2015 with the cologne based musicians Lucas Leidinger, Florian Herzog and Thomas Sauerborn. We play original composition of myself, connecting improvisation with simple composition. The concept is easily explained: Two drums, two basses, piano and trombone come together. MAKKRO plays rhythm and harmony against each other, they shift and interfer musical patterns and open up new spaces. The six musicians from Cologne play together since 2012 and played on a couple of international festival stages (including Moers Festival, Jazz House Festival Hamburg). After the debut Räume, was released 12/2013 on Fuhrwerk Musik, the second album .why has been released in March 2016 on the Cologne based Label KLAENG - records. On ".why“, MAKKRO combines acoustic instrumentation with electronics. The four musicians met in New York and decided to keep on playing after moving back to Germany. They all compose for the quartet and found a way to express their approach with an unique style of interaction. Their music is straight composed and leaves detailed space to vary form and dynamic. The Subway Jazz Orchestra combines 18 of the finest young Cologne based musicians. The Orchestra plays every 2nd Wednesday of the month at "their" club Subway. They work with international renowned musicians and composers, such as Helge Sunde or Steffen Schorn, and create every month a completely new program for large ensemble. In 2013 Florian Herzog and Janning Trumann formed a duo to experience new sounds. They work with minimal structures to express their approach of interaction. Janning Trumann (*1990) studied Jazztrombone at the Conservatory of Music in Cologne and at New York University. As a instrumentalist and composer he is active all around Germany. There, he organizes and curates his own concert series. His actual focus is on the work with his own Quartett. Janning Trumann (*1990) studierte Jazzposaune an der Hochschule für Musik und Tanz Köln und der New York University. Er ist als Posaunist und Komponist seiner eigenen Ensembles Deutschlandweit zu hören. 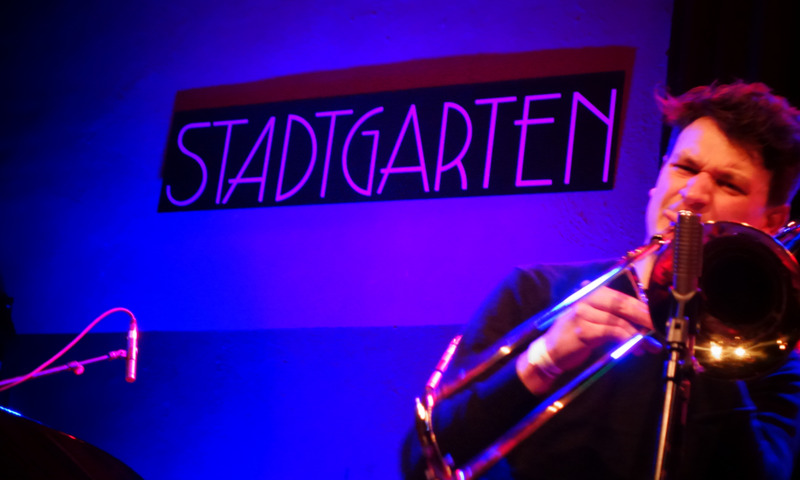 Darüber hinaus ist er als Kurator eigener Konzertreihen in Köln tätig und Sprecher der Kölner Jazzkonferenz. In 2016 gewann Janning Trumann den renommierten „J.J. Johnson Award“ der Internationalen Posaunenvereinigung ITA und wurde mit dem „Förderpreis Musik des Landes Nordrhein Westfalen 2016“ ausgezeichnet.